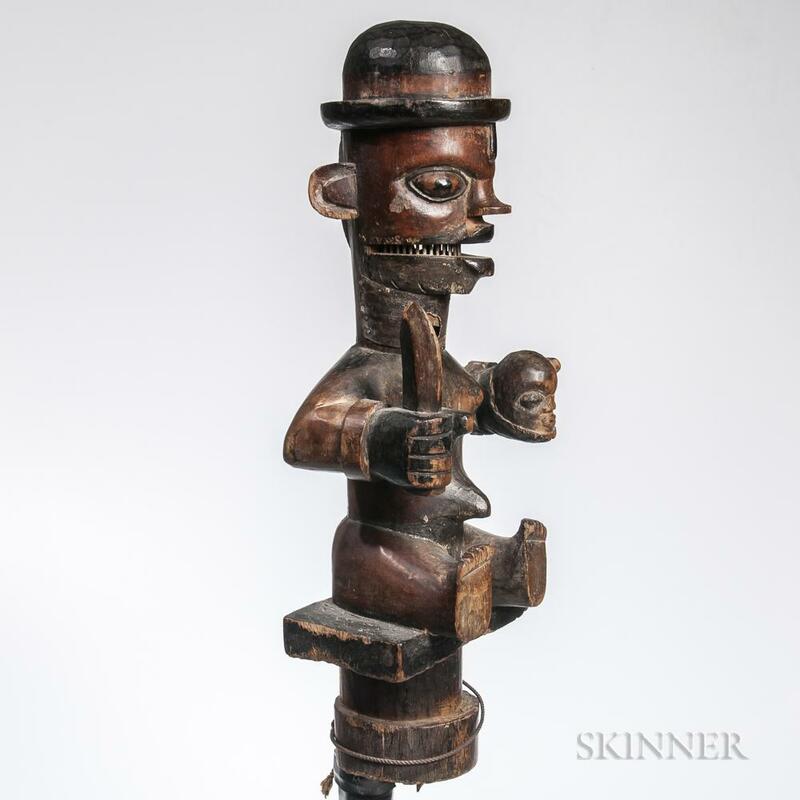 American Indian & Ethnographic Art | Skinner Inc.
MARLBOROUGH, MA – July 5, 2018 – Skinner, Inc. is pleased to announce a Tribal Art online auction, with bidding open through July 11, 2018. 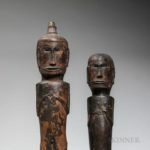 With a breadth of material spanning the globe; tribal cultures from American Indian, pre-Columbian, African, Oceanic, South-East Asian, and more are available for bidding in an online auction format. Now is a good time to buy Southwest pottery. A large amount of material is coming onto the market, and for that reason you can easily find great, affordable pottery from the American Indian pueblos. Before you buy, it’s best to study the material and determine what appeals to you. Some people collect for rarity; others collect to decorate their Southwest-themed abodes. Finely decorated pottery that was used by the people themselves is always very desirable. The rarest historic pottery is from Santa Ana. Because of their innovative designs and the fact that their pottery tradition ended at about the turn of the 20th century, a large Santa Ana olla could bring $100,000 or more. 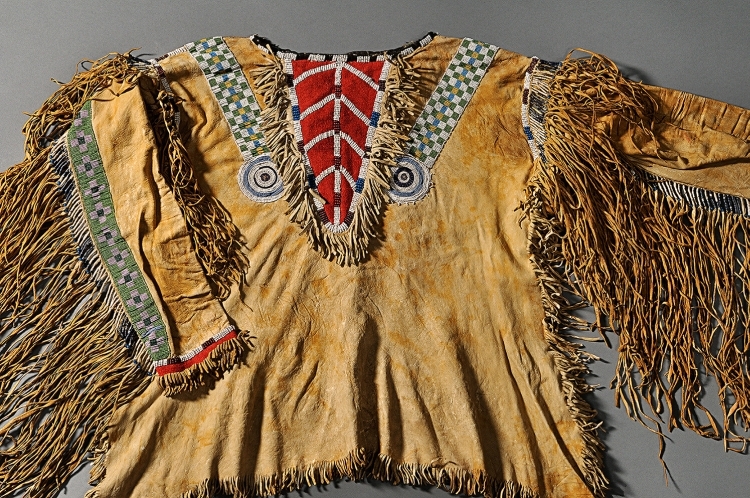 Many Plateau tribes made flat beaded handbags, vests, and other items in the last quarter of the 19th century. The earliest known examples show horse imagery and floral designs as well as other subjects from the natural world. These designs were generally arranged in a simple fashion on light backgrounds. 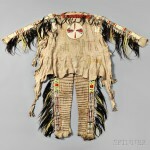 American Indian Plains material is one of the most popular and consistently available collecting areas in American Indian art. Plains Indians, including the Blackfeet, Cheyenne, Lakota, Sioux, Crow, Kiowa, and Comanche, populated the continent from Texas to Canada, from west of the Missouri River to the Rocky Mountains. 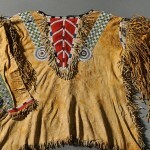 While some Plains Indian material was made for the tourist market, many examples were worn and used by Indians themselves, making them all the more desirable. A Penobscot woman nicknamed Mary Molasses sits staring at the camera, a tall, pointed cap on her head and a large silver brooch adorning her neck. This 1860 photo is a relic of a time when the Penobscot Nation in Maine still spoke its own language and wore traditional clothing made almost entirely from European trade goods. I realized the minute I first saw the weaving, with the variegated wool, the browns, all this great character, that this had to be a really early third phase Chief’s blanket. The consignors didn’t have a clue what they had. I told them, “Don’t worry, you’ll be happy.” When they saw the price realized online, they told me they had to look it up five or six times. They didn’t believe it.